In Japan, one of the most well-known and loved dishes is tamago. Also known as tamagoyaki, this delicious egg dish is made up of several fried egg layers rolled up. Tamago is usually enjoyed alone, with seasonings, or on sushi. In order to make this dish, you need to use a tamago pan. So, how do you choose the best one? 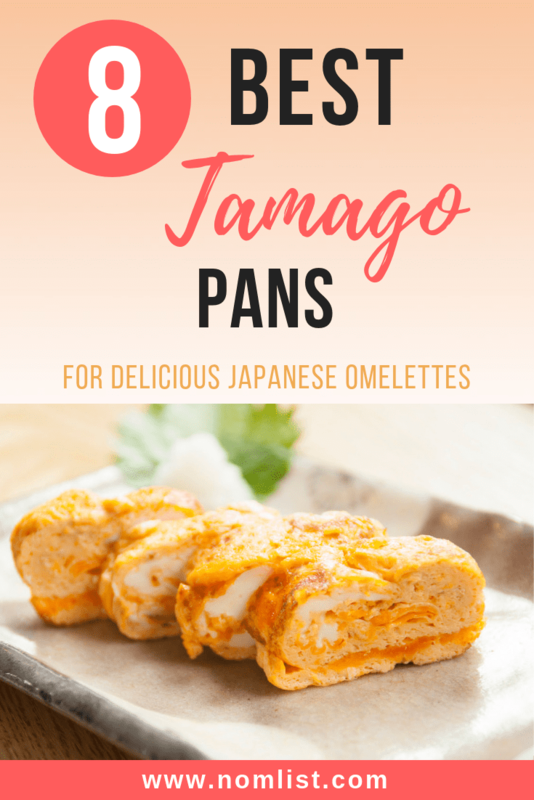 We reviewed the best tamago pans on the market just for you! In Japanese cuisine, there are several types of tamagoyaki. The most basic form is made by combining eggs plus seasonings like sugar or soy sauce. Additionally, sake and mirin can be added for extra sweetness and flavor. An alternative version includes a mix of shrimp puree, grated mountain yam, sake, and egg, turned into a custard-like cake. Tamagoyaki is served around the world in the form of nigiri and also appears in many types of sushi rolls. In Japan, you can enjoy tamagoyaki as a breakfast dish with toppings. As part of a sushi/sashimi dinner, you can eat tamago like a dessert! Also, the pan has a convenient wooden lid, which keeps your eggs flat and cooked evenly. The handle is made from sturdy wood keeping it cool to touch. To add to that, this product is imported from Japan, so it is as classic as you can get! Overall, this tamago pan is one of the best and highest quality products on the market. We highly recommend this for those who have a little more tamago-making skills and want to upgrade their kitchen artillery. Want a tamago pan that's affordable, long-lasting, and high quality? Well, you've come to the right place. This TeChef Tamagoyaki Japanese Omelette pan is an incredible product coated with non-stick Teflon. Coming in at 8.5" x 8.5", this pan fits a perfect 4 egg omelette, which is excellent for Tamagoyaki. The Induction-Capable extra-heavy gauge aluminum construction is equipped with a stainless steel base. Also, the teflon non-stick coating is free of harmful chemicals and safe to make! In the end, we know you'll absolutely love this tamago pan! If you've ever had the opportunity to have tamago, you'll know that one of the greatest features of this dish is the square shape. 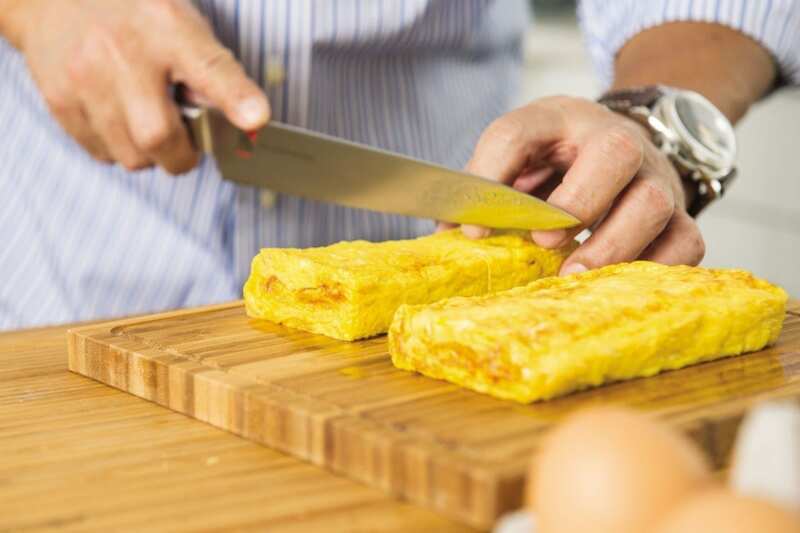 In order to achieve that shape, you need a great non-stick square tamago pan. This pan is made from heavy-duty Aluminum-Manganese alloy and has a durable construction. Also, this pan features a Maifanite stone non-stick coating for easy-release, which also gives an even and quick heat conduction. With an unique sloped shape, this pan allows for easy flipping of your favorite tamago recipes. By far, this is one of the best tamago pans on the market for the price. We highly recommend it! For those of you who are cooking for 1, this is the perfect tamago pan for you! These incredible eco-friendly single-serve pans are made from healthy ceramic non-stick safe cookware that doesn’t contain any toxic chemicals or persistent pollutants. Since these pans are smaller and have great even heat distribution, they make the perfect single-serve tamago portions. Also, the stay-cool silicone wrapped handles are designed for a comfortable, slip-free grip. Overall, we know you'll absolutely fall in love with this tamago pan. Once you use it, you'll never go back to your old one! To all of you aspiring Japanese cuisine chefs, you MUST add this to your kitchenware collection. This incredible tamago pan is the highest professional grade quality and delivers perfectly cooked tamago eggs, every time! Coming in at 8-1/2in x 8-1/2in x 1-1/2in, this pan is big enough to fit a 5 egg omelette comfortably. That means you can optimize your cooking amount for less cost! Also, the pan has a non-stick surface and a wooden handle. If you're looking for a traditional pan, this pan is imported directly from Japan. In the end, we know you will love this pan for cooking professionally or at home. Finally, a tamago pan that delivers quality, affordability, and overall awesomeness! This tamagoyaki pan is made of iron with a wood handle. As many of you know, Iwachu is one of the finest and most respected manufacturers of Japanese ironware, with a company history of over 100 years. The superior quality, beauty and lasting durability of Iwachu products have earned them the worldwide reputation as the leading manufacturer of authentic Japanese ironware. All in all, this is a gorgeous tamago pan that will improve your Japanese cooking. Because of the high quality materials and Japanese design, this pan is one of the best on the market! If you want to get a little more creative with your tamago, check out this curved tamago pan with ridges. The curved shape of this tamagoyaki pan makes rolling the tamago omelette much easier. Also, the nonstick surface ensures a perfect looking omelette, every time. Unlike most tamagoyaki pans, the handle of this pan is attached at a 90 degree angle making usage less awkward and more comfortable especially during rolling. Plus, this set includes a special tamago spatula! Or, you can use a wok spatula, too. In the end, we know you're going to have a blast making tamago with this curved tamago plan. Your friends and family will love sushi night when you introduce your new tamago to the menu! Because of its sloped shape, eggs can be rolled and flipped with ease. With a stainless steel magnetic conductive base, this feature makes the pan usable on both gas stove and induction hob. Also, the pan is made from heavy-duty Aluminum-Manganese alloy with an extremely durable construction. All in all, we know you're going to absolutely fall in love with this super functional tamago pan. We highly recommend it! And lastly, we finish off our article with this amazing tamagoyaki chef in the streets of Japan itself!